The F1 calendar is rather bloated these days, with 19 races on it; thus as we stand before round five we've barely reached the quarter distance point. 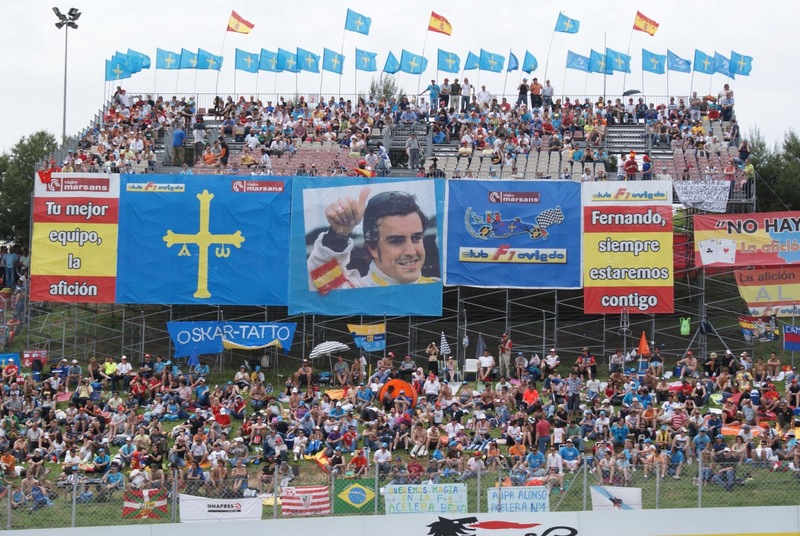 And yet the lap times in the Spanish Grand Prix meeting this weekend, the first European round of the year, should go a long way to framing the holistic story of the 2013 World Championship. No, I'm not being melodramatic. Not entirely anyway. The start of the European season has in recent times felt a lot like the end of the Phoney War. It is the scene of one of the campaign's most pivotal points for just about the entire paddock; everyone will roll up armed with a package of technical upgrades in the hope of making a giant stride forward. And in the European season the itinerary begins to taken a helter skelter quality, if you're not on the pace here then the probability is that several more races will pass by the time you're able to sort it (that's if you're able to sort it at all of course). And by that time your fate in the championship tables could be largely set. And that the Phoney War ends at the Montmelo circuit near Barcelona compounds this; the track has long been considered as a bellwether. It has a variety of corners, gives the car a full aerodynamic workout and that some of the turns are long means that it's not the sort of place that a fundamentally underperforming car can be hustled around with great success (this in part explains its popularity as a test venue). Around here the car must do the work. 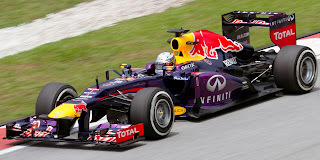 And this year it is all even more acute than usual: with major technical changes awaiting in 2014 every team faces a conundrum of just how much resource in 2013 is put towards next year's car. And how competitive they are now will form a major part of that decision. No one will win the world championship this weekend, but it will likely go a long way in causing many teams to in effect thrown in the towel. Already. Thus in the practice sessions this Friday there will be many hearts in mouths. Especially so at McLaren. It's not hyperbole to say that if McLaren's lap times are not competitive this weekend then its season could well be over. While it's impossible to think an operation such as that, one that seeks to win in every season, would write the campaign off altogether, if McLaren does find itself in the situation of still not being among the front runners in Barcelona it seems close to certain that it would sooner or later end up with too big a points deficit in both championship tables and not enough time to pull them back. The stakes for Woking therefore are high. Will it be advantage Sebastian Vettel this weekend? Given Barcelona's status as a bellwether last year's result of Pastor Maldonado taking victory in the Williams, one of F1's biggest surprise victories ever, was rather incongruous. But for all of the venue's reputation for predictability varying track temperatures and wind directions can change lap times substantially and at a stroke (indeed, 12 months ago Lotus were scuppered somewhat by cooler race day temperatures compared with those in qualifying). Yet even with the upgrades up and down the grid it's hard to see where such a shock result can come from this time, aside perhaps from McLaren finally getting it right. In 2013 while times remain fairly close the old order has reasserted itself somewhat, with Sebastian Vettel, Fernando Alonso and Kimi Raikkonen pretty consistently and exclusively victory contenders, and it's difficult to imagine that things will be much different this weekend. Furthermore, what often happens with a paddock-wide round of upgrades is that everyone makes a roughly equivalent forward step and thus we, in effect, end up exactly where we were. With the importance of a good aerodynamic package and a conservative tyre compound selection there are lots of reasons to think that Barcelona will be Red Bull country. Just as in Malaysia and Bahrain the medium and hard tyres are those available, and remember who won those two races. But it might not all be about Seb this time, as Mark Webber's record in Spain (where he's taken pole in two of the last three visits), and at around this time of year, is a good one. It may yet be one of those weekends wherein he reminds us that he is a contender. In regard to the Pirelli rubber, Red Bull's meat may be Lotus's poison, with the team expressing surprise that the soft tyre has not been selected. Most probably code for the fact that the team, its cars famous for their gentle touch on the tyres, does not think the selection is to its advantage. Nevertheless, Barcelona remains one of the toughest circuits of the year on the rubber, particularly with long turns such as turn 3 and an abrasive surface. It seems possible that Kimi will again try a two-stop strategy in order to leapfrog those that he qualifies behind. And then there is Ferrari, whose car has been consistently at the sharp end this year, without the partial variation of the Lotus or even of the Red Bull (even though it's probably not as strong as the other two when either is in its preferred conditions). The F138's fairly-good-at-everything traits should serve it well around Barcelona, but given the odd minor but costly dropping of clangers so far which have left Alonso more than a win off the drivers' table top you feel that all in red cannot afford another sub-standard result. One thing the team can count on though is that there will be no shortage of effort from its lead driver, performing as he is in front of his own people. 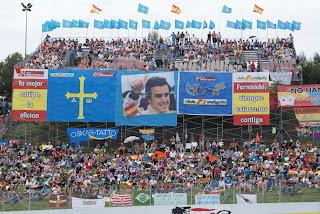 Further, the rule changes of the past couple of years helped challenge the Barcelona track's reputation of giving us rather tepid races (the famous wheel-to-wheel joust here between Nigel Mansell and Ayrton Senna in the debut visit was an inappropriate calling card). But even with the rule changes making overtakes at Barcelona is difficult, and grid slot remains important. The pole-sitter has won here in 11 of the last 12 visits. For that reason, as well as that last year the hard tyre was preferred for race day, and the compound has just been tweaked in order to be more similar to last year's, it will be a surprise if anyone with designs on victory sacrifices qualifying. The show at Barcelona this weekend may or may not be thrilling. But, for a variety of reasons and in a variety of ways, it will almost certainly be important.